Pope Francis said that politicians and religious leaders cannot remain indifferent to the suffering caused by violence and hatred in the world. Instead, those in places of authority and influence must “feel the pain of others, to make it our own, neither overlooking it or becoming inured to it,” the pope said in a message to participants of the International Meeting of Prayer for Peace in the German cities of Munster and Osnabruck. “We must never grow accustomed or indifferent to evil,” he said. Among those addressing the meeting, which was sponsored by the Sant’Egidio community, a Rome-based Catholic lay organisation, were German Chancellor Angela Merkel and Sheik Ahmad el-Tayeb, the grand imam of al-Azhar University. Alongside political leaders, the pope said, religions must “respond to this thirst, to identify and, together with all men and women of goodwill, to pave tirelessly new paths of peace” through prayer and by humble, concrete and constructive efforts. 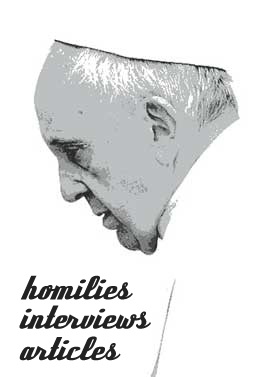 Religious leaders who share the ideals of nonviolence and compassion must encourage peace through “courageous humility and tenacious perseverance in prayer,” he said in his message, which was published in the Vatican newspaper, L’Osservatore Romano. “As religious leaders, particularly at this present moment of history, we also have a special responsibility to be and to live as people of peace, bearing insistent witness that God detests war, that war is never holy, and that violence can never be perpetrated or justified in the name of God. We are likewise called to trouble consciences, to spread hope, to encourage and support peacemakers everywhere,” he said.